Ecuadorian President Rafael Correa’s party appears to have won a sweeping victory in the new constitutional assembly on Sept. 30th giving his party, Acuerdo País (AP), broad powers to transform the nation’s legal system. According to unofficial exit polls the AP won 87.5 percent of the vote, with former President Lucio Gutierrez’s Sociedad Patriotica coming in second with 18.9 percent of the vote. “We are open to dialogue and a national agreement to build a 21st century Ecuador, not a 19th century Ecuador where oligarchic multimillionaires don’t pay taxes,” said Gustavo Larrea, spokesman for the government. However many fear that the assembly will remove existing political checks on the executive branch by dismissing the national congress. In what may be a sign of things to come, Correa invoked the famous Argentinean protest chant of “out with them all” when speaking to a crowd of supporters Sunday night. The Constitutional Assembly has sparked bitter divisions within Ecuador and led to a constitutional showdown between the Executive and Legislative branches in May that temporarily shut down Congress. 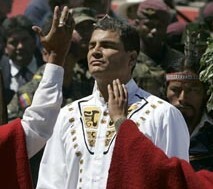 Correa bet that Ecuadorians were tired of continued political instability and would support his calls for deep reform. However, because he was unable to win congressional support for his reforms he called for a national referendum to rewrite the constitution, presumably with a new favorable balance of power. The new 130 member constitutional assembly will now have 240 days to draft a new constitution and submit it to the public. It must then be approved by a simple majority in a national referendum.